There is a Catalan saying that says the best jam is kept in small pots (would translate so something like the best things in life come in small packages). A saying that could be applied to Barcelona: a city that is not that big in size – just 100 km2 – but with an inexhaustible offer of monuments and leisure. 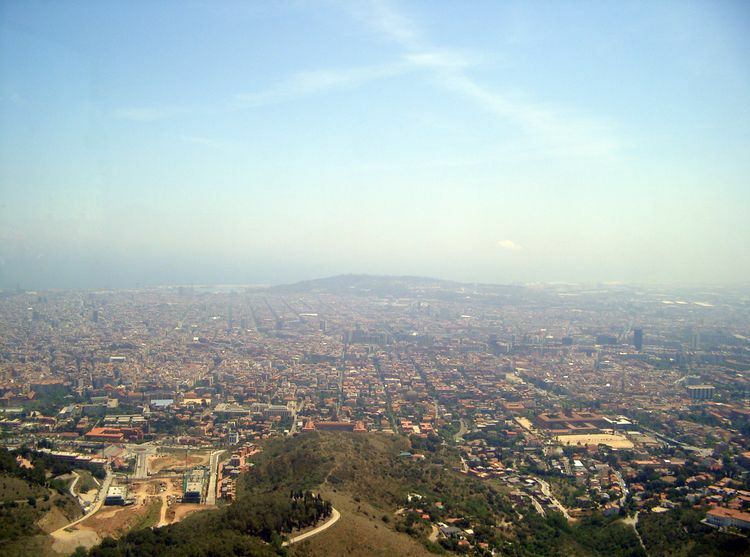 And not only that; even though it has a rather modest surface, it accommodates landscapes full of contrasts: sea, mountain, green areas, hills … To prove it, it is enough to visit some of the incredible viewpoints of Barcelona. Historic buildings, peaks, an old antiaircraft battery … We could even refer to our Lugaris Beach rental apartments, from whose terrace you get unique views over a pine forest and the Mediterranean. 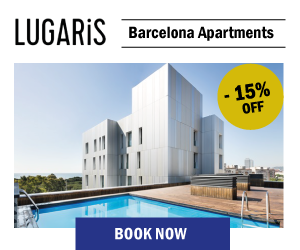 The range of options is huge, without a doubt, but we want to give you some suggestions so you can choose between the best views of Barcelona. Pay attention to this selection that we have prepared for you! This former bullring, in operation until 1977 and reopened as a shopping center in 2011, is a privileged place to experience the feeling of having Barcelona at your feet. From its last floor you will view corners such as the Plaza de Espanya, the Palau Nacional de Montjuïc or the Escorxador park, where the sculpture Dona i Ocell (1983) by Joan Miró stands. Access is free if you use the stairlift within the enclosure (using the exterior lift has an additional cost). 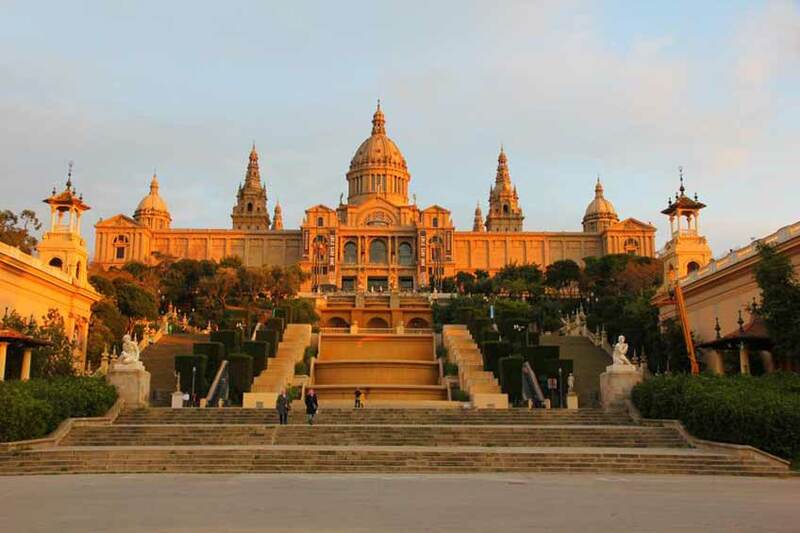 Another amazing option on this list of best views of Barcelona is the aforementioned Palau Nacional de Montjuïc, where the National Art Museum of Catalonia (MNAC) is located. From its viewpoints, you can admire the iconic silhouette of the Tibidabo mountain, which is 516 m above sea level, turning it into the roof of the city. One piece of advice: if your budget allows it, you can have lunch or dinner at the museum’s restaurant. Try it out: it will be a gift for the senses! Built in 1694, this military construction was used as an instrument to control and surpress the Barcelona population for centuries. It also served as a military prison for the Francoist regime until 1960, when it was ceded to the city, and was a military museum between 1963 and 2009. After a short period of free access, the entrance to the castle is possible paying a small fee since March 2014. However, the extraordinary panoramic views of Barcelona from this spot justifies leaving a small amount of money at the box office. Take advantage of your visit to see the temporary and permanent exhibitions that the fortress-castle’s premises house. Have you been to Paris? If so, surely the temple of the Sacred Heart of Tibidabo will remind you of the most important church in the neighborhood of Montmartre, with which it shares its name. Walk inside and, above all, walk up to its terrace to see Barcelona from a privileged perspective. 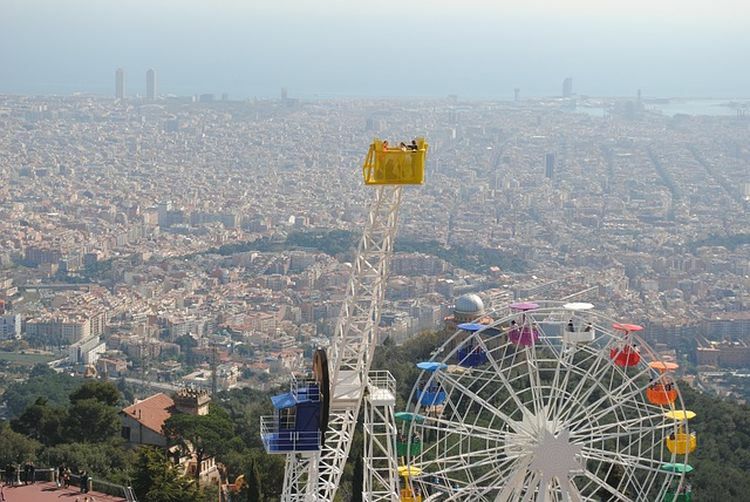 Another magnificent option, if you decide to spend the day at the Tibidabo amusement park, is to ride the mythical Atalaya, opened in 1921 and from which you will see Barcelona at 550 m altitude. But if what you really want is to have a drink in a relaxed atmosphere, we encourage you to visit the emblematic Mirablau, a venue located in the area and whose windows offer a stunning panoramic scenery, making it one of the best rooftop bars in Barcelona. Do you want something even more original? In that case, go to the Collserola tower, 288 m high and designed by the British architect Norman Foster. We are not leaving the National Park of the Serra de Collserola, the main green lung of Barcelona, just yet. The reason? A viewpoint that is as unknown as surprising. Of course: to get there you will have to carry out a pleasant walk through a beautiful Mediterranean forest. The route, which ends in the town of Esplugues de Llobregat (well connected to Barcelona by public transport), starts next to the Baixador de Vallvidrera train stop and leads to the peak known as Coll d’en Portell (351 m) . Once there, take a seat on the wooden bench and surrender to the charm of Barcelona and its metropolitan area. Since we are talking about little crowded places, we want to propose another one that you will love. 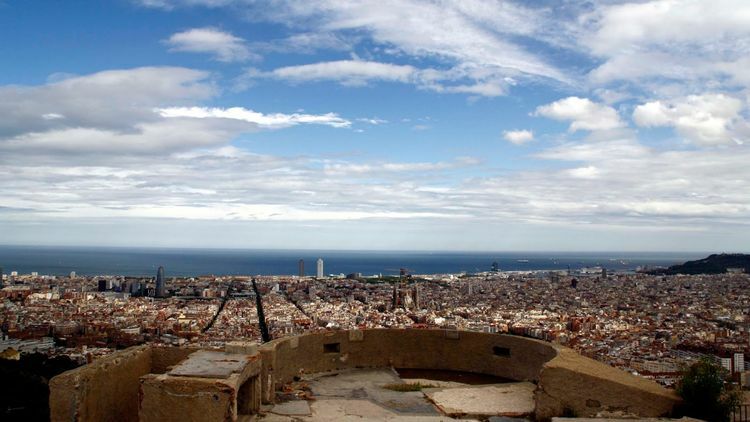 Can you imagine what it will be like to find the best views of Barcelona … with absolutely nobody around? If you are tempted by the idea, you just have to go to the Nen de la Rutlla square, next to the Mare de Déu de Montserrat avenue, and follow the signs that lead to the anti-aircraft batteries of Turó de la Rovira (another exceptional viewpoint even though it tends to be crowded). Halfway, stop under the shade of a pine tree, make yourself comfortable … and enjoy! Halfway between the districts of Gràcia and Horta-Guinardó, it is one of the great icons of Catalan modernism. Concieved thanks to Antoni Gaudí’s inspiration and vision to house a garden city that never came to an end – only a couple of houses were built- you can find the main staircase and the famous hypostyle hall, topped with a square with modernist benches. This place boasts unbeatable views of Barcelona and the Mediterranean. Although the monumental area is not free, a part of the park is open to all visitors. 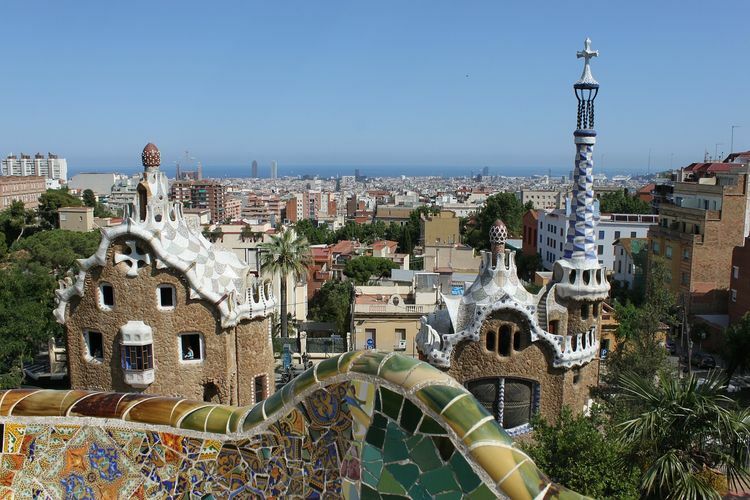 By the way: since 1984, Park Güell is part of the list of UNESCO World Heritage Sites. 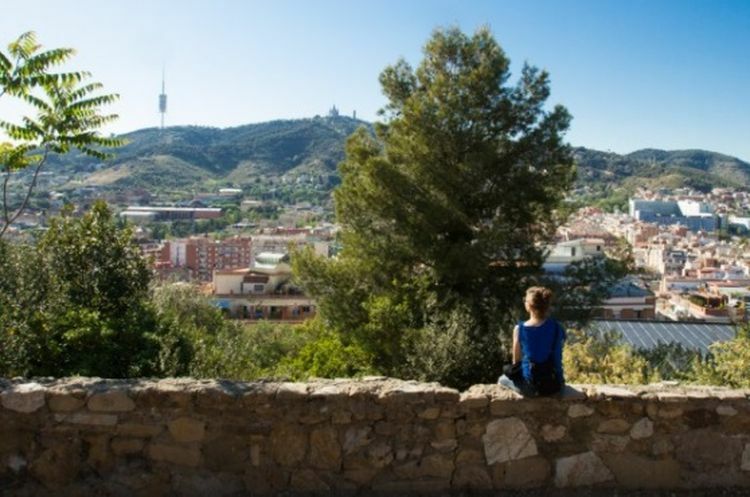 The district of Gràcia invites you to visit this splendid public park of 6,000 m2, located next to Mount Carmel and ideal for those who decide to travel to Barcelona with children. In addition to a large pond ideal for bathing in summer, you can also see the sculpture Elogio del agua (1987), by Eduardo Chillida, and some views of Tibidabo and the western part of Barcelona that are breathtaking. 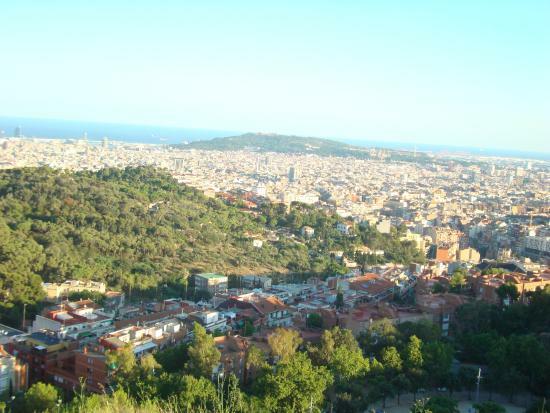 Did you know that, like Rome, Barcelona also stands on seven hills? One of them is the Putxet, located in the district of Sarrià-Sant Gervasi, in the upper zone. 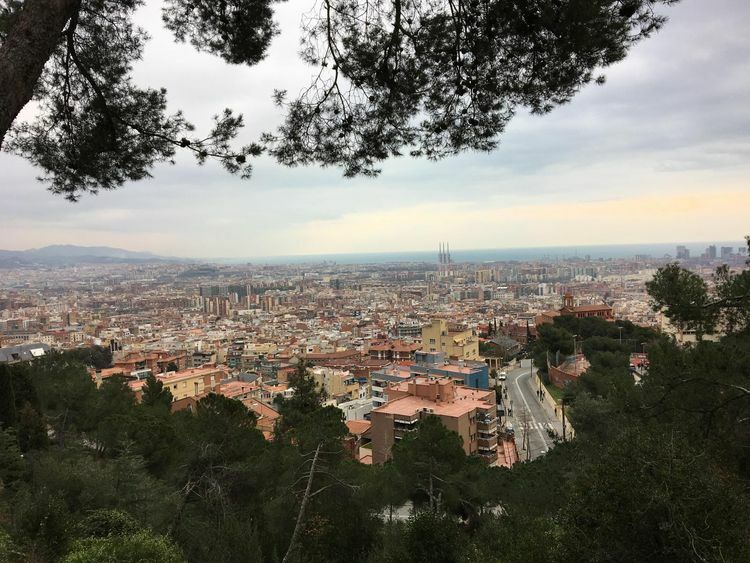 This small hill offers breathtaking 360 degrees views, from the mountain of Montjuïc to the Agbar tower, next to our apartments for rent in Barcelona. You can also see the Mediterranean from this viewpoint. These two buildings of Gothic design, located respectively in the Gothic neighborhood and in Born, are two of the most stunning medieval buildings in Barcelona and, at the same time, two inspiring watchtowers from which to view the skyline of Barcelona. Both are paid and require climbing many steps, but we guarantee that the effort is worth it. 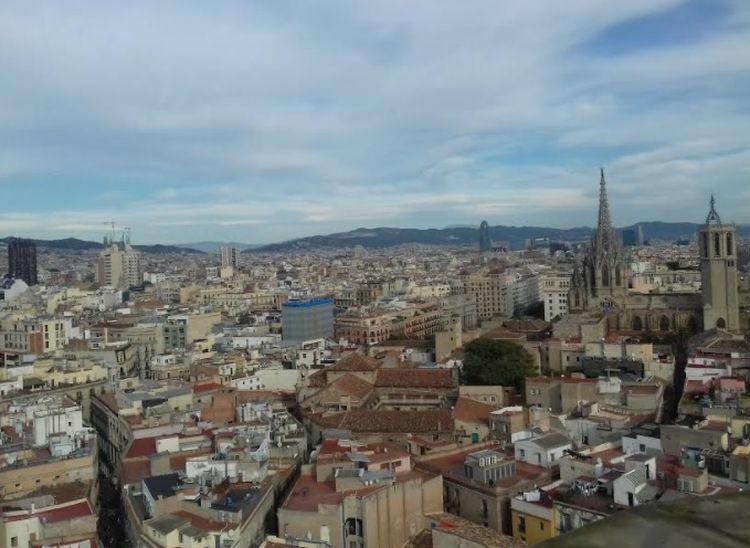 Found the best views of Barcelona? From our apartments, you can easily walk up to the most spectacular viewpoints. However, if you know of any other places worth mentioning, do not hesitate to leave a comment explaining where your ideal spot to wawtch the sun set is! To begin with, the Arenas has many bars and restaurants on its rooftops. Tibidabo also has a small take away café at the top and Montjuïc also has a small bar called “La caseta del Migdia” where you can stop for a drink. But if you want to have a drink and enjoy the perspective, how about taking a look at the best rooftop bars in Barcelona?